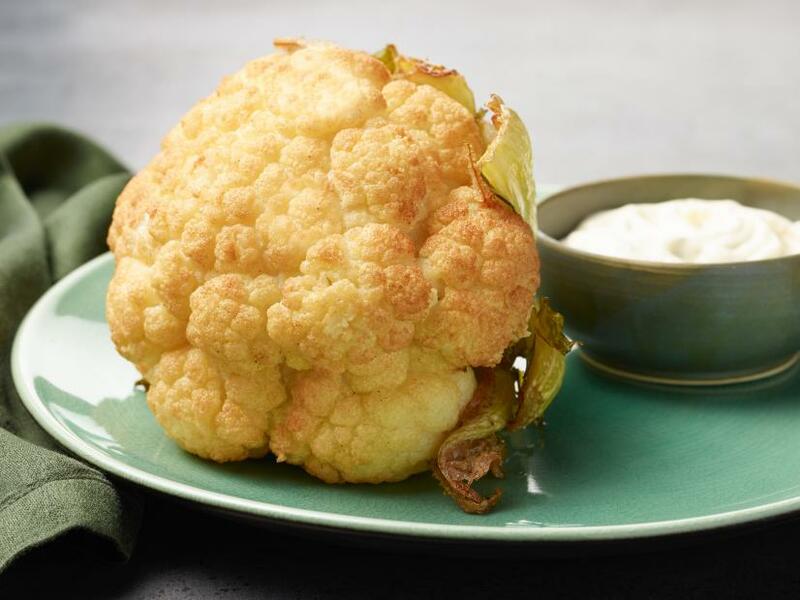 Cauliflower takes center stage in this deceptively simple dish that could be served as an entree or as a side to your favorite roasted chicken or turkey. By frying the cauliflower whole, it turns a deep golden color and becomes perfectly tender in a fraction of the time it would take if you were to roast it. We add a creamy lemon dipping sauce that adds just the right amount of zip. Whisk together the mayonnaise, lemon zest and juice, parsley and a large pinch of salt and pepper in a medium bowl until smooth. Refrigerate while you fry the cauliflower. Fill a large, deep stockpot halfway with oil and heat to 375 degrees F over medium-high heat. Set a cooling rack over a baking sheet. Gently lower the cauliflower into the hot oil with a large spider or large slotted spoon. This might splatter so be very careful once the cauliflower is in the oil. The cauliflower might not be fully submerged, but that is okay. Cook until the cauliflower is golden brown and you can easily insert a paring knife into one of the florets, 5 to 7 minutes, carefully flipping the cauliflower halfway through the cooking time. Lift the cauliflower out of the hot oil using the large spider or slotted spoon and transfer to the cooling rack. Season liberally with salt. Allow the excess oil to drip away before putting the cauliflower onto a large serving platter. Serve alongside the creamy lemon sauce.